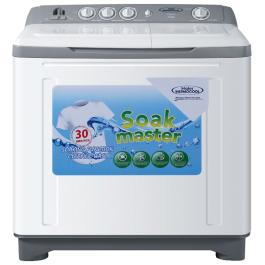 This Top Load Semi Automatic Washing Machine offers a 30 mins pre-soak setting, making it easier to get rid of those tough and stubborn stains that are usually a burden. Its anti-rust shell and electrical component protection mean that this is a washing machine that is built to last! Electrical Component Protection:Electrical components are protected against water spillage for users safety. Pure Plastic Cabinet: Waterproof, anti-rust, lightweight, easy to move and hard to be out of shape. Removable Truckle Design: The washer with removable truckle is very mobile and can wash clothes in any room of your house and even outdoors too! Anti-Rust Shell:This Lacquered cabinet is anti-rust and antiseptic helping to sustain your washer’s appearance and prolong its lifespan.